It looks like Miley Cyrus is having a blast with her family in her country field of Nashville! Miley Cyrus posted a lovely picture on Instagram of herself enjoying with her family this Saturday. Let’s get an insight on how this superstar spent her weekend! Family on board! The country singer and songwriter, Miley Cyrus just posted a picture of her entire family having a fun time during the weekend. Present in the Instagram photo were her brothers Trace and Braison, sister Brandi and her parents, Tish and Billy Ray, all of whom looked super chilled and stylish. The ‘We Can’t Stop’ singer who is 24 furthermore added pictures with each of her family members. Some serious love is shown! She posted one with her 22-year-old brother, Braison and captioned it ‘Sugaaaaa Bear’ with some cute emojis. Miley shared one with her family dog; a white and black pup soaking up the sun with Miley’s sister and mom. She’s gone o the Nashville farm so of course there were animals! Selfie with a beautiful horse and a cow were also posted on her Instagram account! Nashville for Miley has been too close to the heart because we know that she is all country! However, the purpose for the reason for being in Nashville might also be for the show Cyrus vs. Cyrus. Miley’s mom Tish has a new Bravo show named Cyrus vs. Cyrus coming pretty soon. Thus Miley might have been there for the shoot of an episode with her sister Brandi. And while working for the show, why not see the moment and meet up with all the members of the family! While Miley was busy with her family, her fiancé Liam Hemsworth was also seen super busy and involved with his family this weekend. Liam was with his brother Luke Hemsworth in Malibu enjoying the surf. It seems that the couple has decided to be closer to their family despite the busy schedule. Miley seemed to have a great weekend! Even after the busy and tiring schedule, Miley has been spending enough time with her family which is adorable! 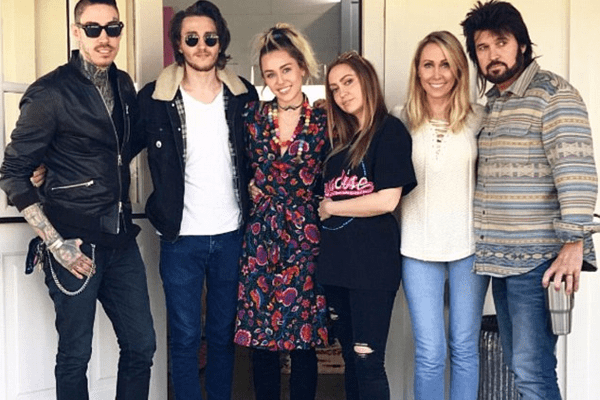 Miley has shown that she has immense love for her family members and we can’t deny the fact! We hope to see the love growing.